Very few people write handwritten letters nowadays - it's all about texting and emailing and Skyping and other things. But there's something special about a handwritten note or letter, a thrill you just don't get with other forms of communication. I have one friend with whom I still exchange handwritten letters, and despite the fact that she and I don't see each other very often, our letters connect us and bring us closer to each other. 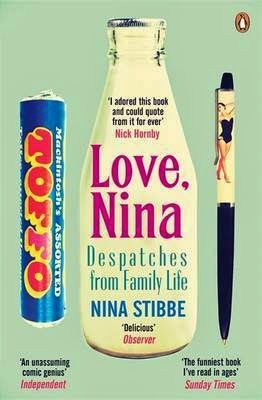 So Love, Nina, a collection of letters from author Nina Stibbe to her sister Vic, is a joyous read. Written when Stibbe moved to London in the 1980s to become a nanny to Will and Sam Frears, the sons of London Review of Books deputy editor Mary-Kay Wilmers, the letters are a wonderful window into domestic life. Stibbe's letters introduce us to Sam and Will, who are brilliantly clever and insightful for two young boys; their mother Mary-Kay, who balances home and work with what looks like ease and humour; and a motley collection of friends and neighbours, including the playwright Alan Bennett. Although the letters are one-sided (Stibbe didn't keep those sent back by Vic), they form a coherent narrative. We clearly see Stibbe getting older and wiser, although as a young woman there are still plenty of awkward moments, not to mention a healthy dash of judging people and a fair amount of culinary experiments, some of which don't turn out very well. We also see the relationships she forms develop, from those with Sam and Will and Mary-Kay, which continue even after she moves out and starts going to college, to new friendships with girls and boys she can't at first seem to make head or tail of, to her friendship with Nunney, the boy from down the road. Love, Nina is an illustration of how important letter-writing is, and how it's a skill that should be cultivated and practised regularly. Witty, heartwarming and funny, Love, Nina should have us all rushing to put pen to paper.